Pantheos Houseboat in Prinsengracht with a view of the Westerkerk the Landmark. Property 1: Pantheos Houseboat in Prinsengracht with a view of the Westerkerk the Landmark. Property 9: Beautiful houseboat at 15 min. from Amsterdam Central! Houseboat In The Center, 5 min walk to Tropical Museum, Free Wifi! Property 18: Houseboat In The Center, 5 min walk to Tropical Museum, Free Wifi! Romantic houseboat in Amsterdam center! Property 19: Romantic houseboat in Amsterdam center! Cozy Houseboat on famous canal in Amsterdam, the place you want to be! Property 23: Cozy Houseboat on famous canal in Amsterdam, the place you want to be! Very nice spacious houseboat in the center of Amsterdam .Jordaan Area. Property 33: Very nice spacious houseboat in the center of Amsterdam .Jordaan Area. Bright & Spacious Studio @ eco houseboat! Property 37: Bright & Spacious Studio @ eco houseboat! Houseboat close to the city center of Amsterdam. Property 38: Houseboat close to the city center of Amsterdam. Your Own Lovely Houseboat; Safe, Clean and Cosy! Property 40: Your Own Lovely Houseboat; Safe, Clean and Cosy! Property 41: GREAT HOUSEBOAT FOR RENT IN AMSTERDAM! Romantic private room on houseboat Amsterdam with beautiful view. Property 43: Romantic private room on houseboat Amsterdam with beautiful view. Central & Modern studio on Eco-Houseboat! 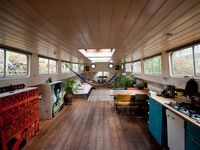 Property 49: Central & Modern studio on Eco-Houseboat! 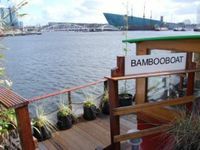 If you want to stay somewhere authentic in Amsterdam, you need to try the Bamboo Boat. It was very fun AND it was in a great location. The houseboat is across the water from the Sea Palace - the big Chinese floating restaurant, and other commercial establishments. The tour boats go by fairly frequently, so this is an area worth seeing. And, it's right by the train/bus station, so that's a plus. The houseboat is cozy - two levels with a kitchen and bed/bath on each level. The downstairs is slightly larger and you can look out the portholes at the boats and ducks. A cat came and looked at us a few times, so we met the neighborhood cat. The boat has everything you need - fridge, dishwasher, coffee. Han even had lovely tulips and a few cold ones waiting for us. (Thanks Han!). There is a grocery store around the corner. We sat out on the deck quite a bit and watched the boat traffic. It was a nice break from touring and a good place to enjoy drinks and a snack. There are bikes available, too, but we didn't make time this trip. I will say that lugging big suitcases to the boat wasn't the best. Smaller is better for sure, but we made it work. And, if you are mobility or balanced challenged, you might have trouble with the walkway to the boat or the stairs (a ladder, basically) to the lower floor. It was a great experience and we really enjoyed being part of the houseboat community. If you book it, enjoy! Highly recommend this boat house! It&rsquo;s in a great location (close to tram/metro and grocery store) and perfect with kids. Joost was easy to work with and provided a ton of helpful tips.